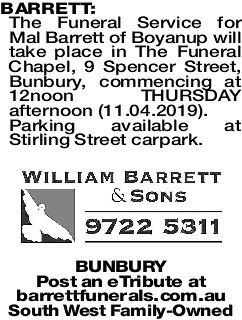 The Funeral Service for Mal Barrett of Boyanup will take place in The Funeral Chapel, 9 Spencer Street, Bunbury, commencing at 12noon THURSDAY afternoon (11.04.2019). Parking available at Stirling Street carpark. 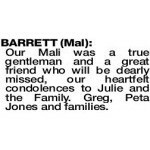 BARRETT (Mal): Condolences to JULIE and families. Praying for you all at this sad time. 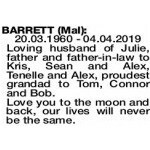 20.03.1960 - 04.04.2019 Loving husband of Julie, father and father-in-law to Kris, Sean and Alex, Tenelle and Alex, proudest grandad to Tom, Connor and Bob. Love you to the moon and back, our lives will never be the same. 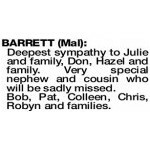 BARRETT MAL Dearly loved son of Don and Hazel. We are so proud of you. Until we are all together again, have a well earned rest mate. BARRETT MAL Our beautiful Brother Mal. We are heartbroken. We will miss and love you for the rest of our lives. Love you millions. Donna, David, Janelle, Kev and families. 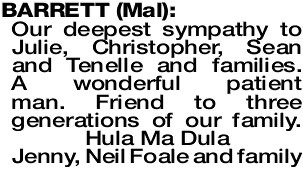 Deepest sympathy to Julie and family, Don, Hazel and family. 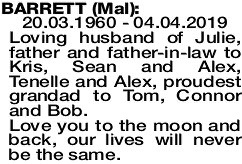 Very special nephew and cousin who will be sadly missed. Bob, Pat, Colleen, Chris, Robyn and families. 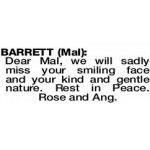 Dear Mal, we will sadly miss your smiling face and your kind and gentle nature. Rest in Peace. Rose and Ang. 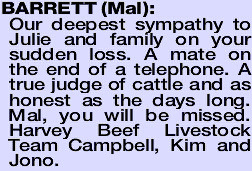 BARRETT MAL Our Deepest sympathy to the Barrett Family on the sudden loss of Mal. Management and staff of S and C Livestock. 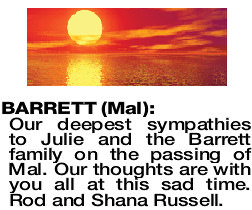 BARRETT MAL Our deepest sympathy to Julie and family on your sudden loss. A mate on the end of a telephone. A true judge of cattle and as honest as the days long. Mal, you will be missed. Harvey Beef Livestock Team Campbell, Kim and Jono. 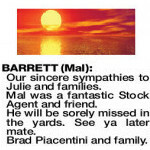 BARRETT MAL Our sincere condolences to Julie and family on the sudden passing of Mal. Our thoughts are with you in these sad times. 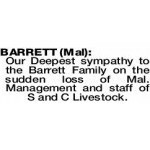 From Management of Harvey Beef. 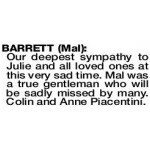 BARRETT MAL Our deepest sympathy to Julie and family on your loss. 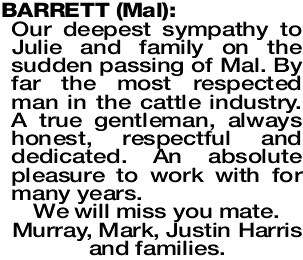 Mal will be missed by so many - a cattle man through and through, a man who was a true gentleman and was an absolute pleasure to work with for so many years. Our deepest sympathy to Julie and all loved ones at this very sad time. 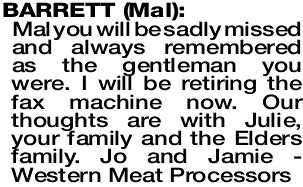 Mal was a true gentleman who will be sadly missed by many. Colin and Anne Piacentini. 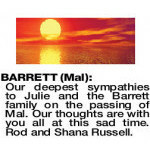 BARRETT MAL Our sincere sympathies to Julie and families. 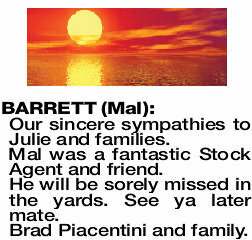 Mal was a fantastic Stock Agent and friend. He will be sorely missed in the yards. See ya later mate. 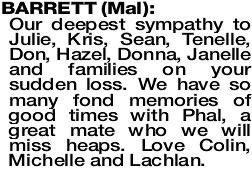 BARRETT MAL Our deepest sympathy to Julie, Kris, Sean, Tenelle, Don, Hazel, Donna, Janelle and families on your sudden loss. We have so many fond memories of good times with Phal, a great mate who we will miss heaps. 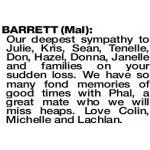 Love Colin, Michelle and Lachlan. 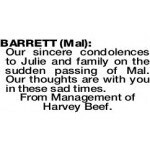 Our deepest sympathy to Julie and family on the sudden passing of Mal. By far the most respected man in the cattle industry. A true gentleman, always honest, respectful and dedicated. An absolute pleasure to work with for many years. We will miss you mate. Murray, Mark, Justin Harris and families. 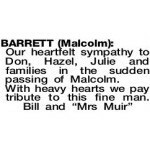 Our heartfelt sympathy to Don, Hazel, Julie and families in the sudden passing of Malcolm. 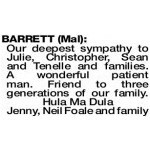 BARRETT MAL Deepest sympathy to Mal's family and Elders colleagues on the sad passing of Mali. 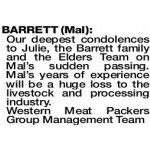 A very real loss for the WA livestock Industry. From Primaries Management and Staff. 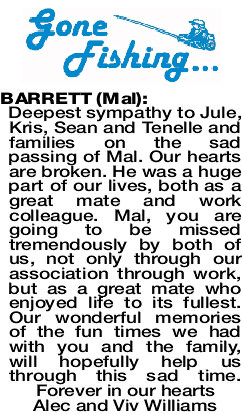 BARRETT MAL Our Mali was a true gentleman and a great friend who will be dearly missed, our heartfelt condolences to Julie and the Family. Greg, Peta Jones and families. 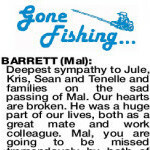 BARRETT MAL Our deepest sympathies to Julie and the Barrett family on the passing of Mal. Our thoughts are with you all at this sad time. Rod and Shana Russell. 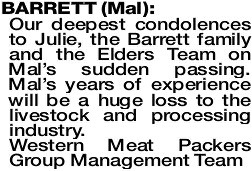 BARRETT MAL Our deepest condolences to Julie, the Barrett family and the Elders Team on Mal's sudden passing. 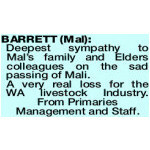 Mal's years of experience will be a huge loss to the livestock and processing industry.